Welcome to the world of Infinite possibilities with the TouchPoints MyChoice Infinite Credit Card. Available only to our most valued Excellency customers, the TouchPoints Infinite Credit Card has been designed to meet the highest expectations, offering exclusive elite services and superior benefits. It is the ultimate in status and recognition, providing unprecedented levels of services, unparalleled benefits and offers maximum purchasing power. 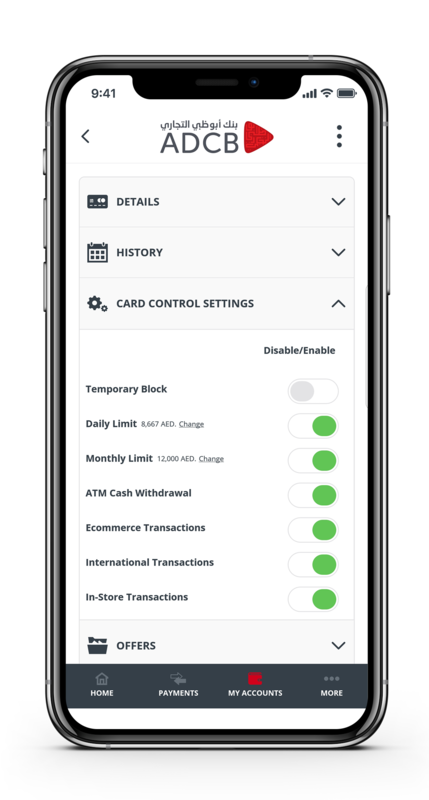 The Infinite Credit Card benefits offer cardholders with the ultimate in status and recognition, providing unprecedented levels of services and maximum purchasing power. To enjoy the MyChoice bonus rewards, simply make total purchases worth AED 2,500 every month for each of the enrolled categories. Please note that your total purchases include your purchases within the chosen category as well as all other purchases during the month. What’s more, purchases with your TouchPoints Infinite Credit Card will still earn rewards at 1.5 TouchPoints for every AED 1 worth of eligible purchase. To select your rewards category, simply login to Personal Internet Banking or call our 24/7 Contact Centre at 600 50 2004. Please note that all preferences registered until 10th of the month will be applicable for the current month while those made later will be applicable from the next month onwards. Enjoy a free movie ticket when you buy one with your ADCB TouchPoints Infinite Credit Card! Feature valid on 2D, 3D and IMAX movie ticket purchases made with your ADCB TouchPoints Infinite Credit Card through the VOX Cinemas website or the VOX Cinemas Mobile App. Simply sign up as a member at VOXCinemas.com to avail this offer! Travel with your TouchPoints Infinite Credit Card and enjoy a richer experience than before. As a Infinite Card member, enjoy unlimited self access plus 1 guest to premium airport lounges across the many cities where you love to travel every year. For more information visit www.adcb.com/lounge. Tee off in style with your TouchPoints Infinite Credit Card. As a Infinite card member, you have the luxury of playing golf for free all year at The Track, Meydan Golf Dubai, Arabian Ranches Golf Club Dubai and Yas Links Golf Club Abu Dhabi. Ride with Careem and enjoy 4 complimentary airport transfers (up to AED 100) when you pay with your ADCB Visa Infinite Credit Card. Use promo code UAEVI. Visit: www.visamiddleeast.com/careem for more details. Discount offered cannot be exchanged for cash or credit. Your TouchPoints Infinite Card provides frictionless access to the finest things in life, no matter where. It offers an extraordinary selection of distinctive travel, dining, shopping and lifestyle opportunities. It gives you complimentary access to a concierge service that exists to satisfy your every whim. Best of all, the service is entirely complimentary, courtesy of Visa International. The Global Concierge Service can help in planning for elaborate vacation itineraries, chartering a yacht or plane, organizing corporate meetings, planning for a special wedding, a birthday dinner, a night out in town, and even sourcing and delivering tickets to sold-out events across the globe. This experience can help create memories to last a lifetime. The Global Concierge Service provides you with a single point of contact to cater to your needs and is available 24 hours a day, all year. The assistance is offered in English, Arabic and Russian. Any payments for the requested services shall be charged to your TouchPoints Infinite Card. For detailed Terms and Conditions on each of the features and benefits provided on your ADCB Credit Card, please visit adcb.com or call 600 50 2004.